Gustav Mahler wrestled with the big questions, and then he set them to music. To create a symphony, for the late Romantic composer, was to create a world. When conductor Bruno Walter visited Mahler in 1896 at his summer retreat in the Alps, the younger man paused to admire the beautiful vista. Mahler told Walter he needn’t bother. Mahler was referring to his Symphony No. 3, the result of that summer vacation, and the Grand Rapids Symphony gave a magnificent performance of Mahler’s hymn to the natural world on Friday, April 12, in DeVos Performance Hall. Friday’s concert ended with a standing ovation that lasted more than four-and-a-half minutes. The concert in the Richard and Helen DeVos Classical Series repeats at 8 p.m., Saturday, April 13. Tickets, starting at $18 adults, $5 students, remain available. Lehninger welcomed Grand Rapids’ own Michelle DeYoung, a three-time Grammy Award winning singer who earned one of her Grammy’s for her 2003 recording of this piece with Michael Tilson Thomas and the San Francisco Symphony. It’s been more than 14 years since DeYoung last appeared with the Grand Rapids Symphony in January 2005. It’s been even longer since the orchestra last performed Mahler’s Third Symphony in February 2002. DeYoung, who was born in Grand Rapids, grew up out west, and returned to study at Calvin College for two years, was joined by the women of the Grand Rapids Symphony Chorus, the young singers of the Grand Rapids Symphony Junior Chorus, and Mandala, a select ensemble drawn from the Grand Rapids Symphony Chorus. In all, nearly 250 musicians were on stage, the biggest orchestra of the Grand Rapids Symphony’s 2018-19 season, to perform the longest symphony in the standard repertoire, lasting 100 minutes. Long perhaps, but it doesn’t seem that long. It’s a big work many big moments, but much of the five-movement work also is subdued and intimate. There’s a lot of canvas to fill, and Lehninger did a commendable job of drawing together the large musical force and guiding it nimbly and efficiently through so many different musical moments. Lehninger, who masterfully conducted the entire work without intermission, supplied the answers. The beginning is massive, beginning with a daunting statement that only eight horns in unison can deliver. It’s also a work of subtlety and refinement. The opening movement, depicting the arrival of the god Pan, was sharply drawn with carefully calibrated colors timbres. Assistant principal trombonist Dan Mattson delivered a sturdy, ominous trombone solo, depicting the end of winter, while the rest of the orchestra celebrated with the brash sounds of summer coming over the horizon. After a long exposition of understated beauty, the exciting end of the beginning was explosive. The song-like second movement, with its lilting minuet rhythm, was sweet, all the more so because of Concertmaster James Crawford’s delightful solos. The rustic-flavored third movement featured a noble, off-stage trumpet solo by Paul Torrisi. DeYoung, who made her first appearance with the Grand Rapids Symphony since 2004, joined the orchestra for the fourth movement, a haunting setting of Friedrich Nietzsche's “Zarathustra's Midnight Song” from “Thus Spake Zarathustra.” DeYoung has an amazing voice with equal measures of passion and power enveloped in a gorgeous tone. More to the point, she expressed the heartfelt humanity of the text. The mezzo soprano sings only a small portion of the work. It also was a pleasure to watch her on stage, listening and reacting to the rest of the performance around her. The women of the Grand Rapids Symphony Chorus joined in for the fifth movement, singing the text, “Three Angels Sang,” with a warm, rich sound. Standing just in front of them, the fourth, fifth and sixth graders of the Grand Rapids Symphony Junior Chorus chimed in with the angelic sound of bells. The symphonic, final movement was one of great delicacy, opening with a beautiful string melody that grew ever more majestic and sublime at the same time. For long moments, Lehninger coaxed more and more from his musicians, drawing a reverent yet passionate melody out of the ensemble. At the end, Lehninger appeared nearly spent. But not before leading a performance of emotional depth and great satisfaction. Grand Rapids Symphony’s former chorus director knew Michelle DeYoung had a very special voice. The mezzo soprano had enrolled in Calvin College as a freshman in 1988, not entirely sure of what she wanted to do with her life. Anton Armstrong, who taught music at Calvin College in addition to serving as director of the Grand Rapids Symphony Chorus, told her she had a special voice worthy of a professional career. Armstrong, who would go on to become director of the famous St. Olaf Choir, was right. 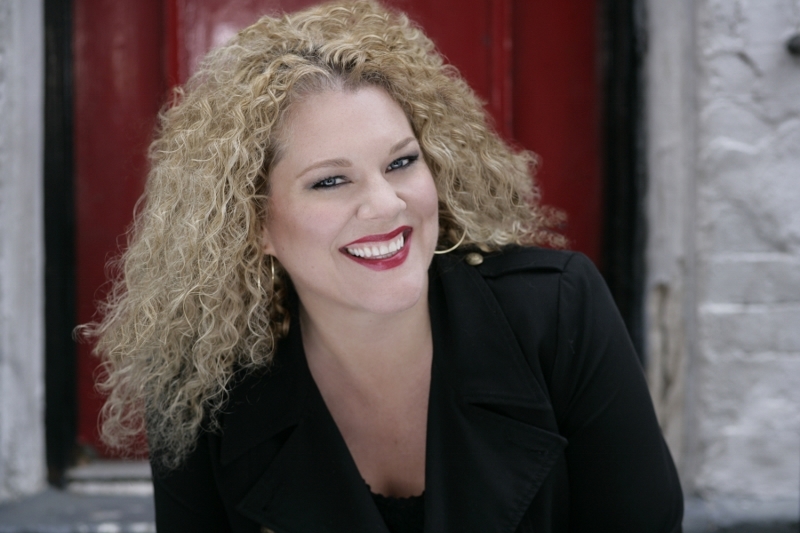 Today, DeYoung is a three-time Grammy Award-winning singer whose career has taken her to the stages of Bayreuth, La Scala and New York’s Metropolitan Opera, where her career began. This weekend, DeYoung joins Music Director Marcelo Lehninger and the Grand Rapids Symphony to perform Gustav Mahler’s Symphony No. 3 on April 12-13 in DeVos Performance Hall. Mahler’s Symphony No. 3, which lasts about 100 minutes, will be the only piece on the program. Michelle DeYoung will make her first appearance with the Grand Rapids Symphony in 14 years to sing the musical work that earned her the 2003 Grammy Award for Best Classical Album together with Michael Tilson Thomas and the San Francisco Symphony. The mezzo soprano was born in Grand Rapids into a musical family, the last of four girls, while her father was studying at Calvin Theological Seminary to become a minister. Growing up in Colorado and in California, DeYoung followed in the footsteps of her three older sisters, all of whom sang in church and played piano and other musical instruments. But in her sophomore year, her choir director told her she had an extraordinary voice, worthy of a professional career, so she left Calvin College to study first at San Francisco State University and then at California State University at Northridge where her teacher told her that he wanted her to enter the Metropolitan Opera Auditions. The 6-foot, 1-inch tall singer didn’t believe her teacher. But she entered the competition, won every level, and was invited to join the Metropolitan Opera’s Young Artists Development Program. “The first day I walked into the Met, I walked into the elevator, and someone said, ‘Oh, it’s Brunhilda,’” she recalled with a laugh. In 2016, Mahler’s Third Symphony was voted one of the 10 greatest symphonies of all time in a poll of more than 100 professional conductors by BBC Music Magazine. That list was topped by Beethoven’s “Eroica” Symphony No. 3 and his “Choral” Symphony No. 9 plus Mozart’s “Jupiter” Symphony No. 41. It’s a popular piece, though it’s seldom performed because of its size and scope. 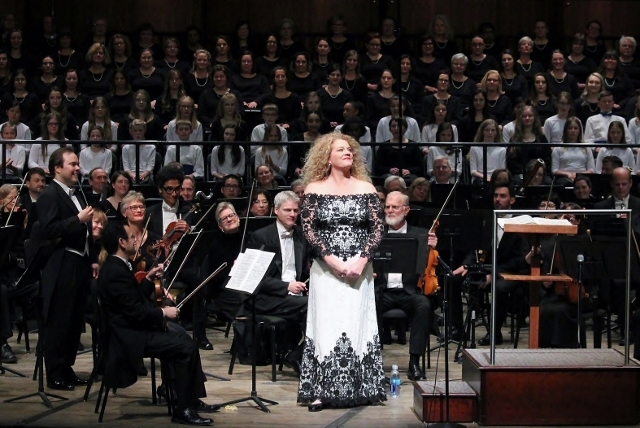 The Grand Rapids Symphony’s last performance of Mahler’s Third Symphony was in February 2001, featuring mezzo soprano Marietta Simpson, the Women of the Grand Rapids Symphony Chorus, and the Boys from the Grand Rapids Choir of Men and Boys. Mahler, who was one of the greatest conductors of the late 19th century, was devoted to nature and enjoyed long walks in the countryside. In the summer of 1896, the young conductor Bruno Walter paid a visit to Mahler in the little Alpine village of Steinbach am Attersee, where Mahler had spent the summer completing his Third Symphony. As Walter stood there admiring the beautiful mountain scenery, Mahler told him, “You needn’t stand staring at that. I’ve already composed it all. 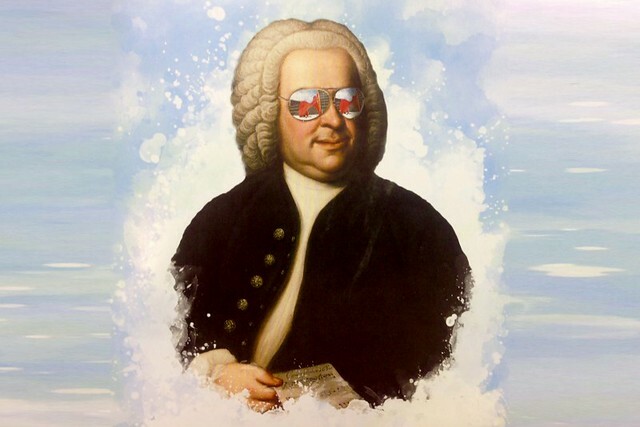 One can wonder how and why the music of Johann Sebastian Bach is relevant in a world of soundbites, digital samples, mp3 players and downloadable podcasts. What can an early 18th century composer say to a 21st century audience? Plenty, and all you have to do is listen. And that’s just what a full house did in the Basilica of St. Adalbert for the final concert of the 2019 Grand Rapids Bach Festival. The 12th biennial festival ended with a grand and glorious finale with Bach’s Magnificat in D Major on Saturday, March 23, under the masterful leadership of its new Artistic Director Julian Wachner. In his first season leading the festival founded 22 years ago, Wachner led soloists, the Grand Rapids Symphony and Grand Rapids Symphony Chorus in a sold-out performance with no room to spare. With no fewer than 125 singers in the Grand Rapids Symphony Chorus, the performance was destined to be big and bold. With a fireball Artistic Director who’s a bundle of energy even at rest, it was destined to be even a little over-the-top. Bach was a good Lutheran, but his region of Germany was influenced somewhat by Catholic Austria. Liturgical texts in Latin were not unknown. Certainly Bach’s B minor Mass, arguably his greatest work of all, was in Latin. The setting of “My Soul Doth Magnify the Lord” from the Gospel of Luke is the first major, liturgical work by Bach using a Latin text. It’s also a wonderful piece of music that Wachner conducted with passion and precision in equal measure. The Grand Rapids Symphony Chorus sang the opening with bright buoyancy, sending waves of sound crashing through the sanctuary. Wachner assembled a fine group of five soloists including soprano Molly Quinn, a last-minute substitute for Molly Netter, who had to withdraw from the performance. Accompanied by Ellen Sherman on the seldom-heard but charming oboe d’amore, Quinn sang with authority and reverence. Second soprano Melissa Attebury delivered her solo aria with style and a little bit of sass. Tenor Bran Giebler sang nimbly on his aria with its bright tempo. The bass declaims the text, “He that is mighty has magnified me,” and bass-baritone Dashon Burton gave his aria a robust performance in a sanctuary that isn’t especially kind to lower voices. The chorus, which kicks it off, also gets the big finish. The four-part harmony was well-balanced on the penultimate chorus, and the concluding Gloria Patri was majestic and magnificent. Linn Maxwell Keller, who founded the Grand Rapids Bach Festival in 1997, wanted the community-wide festival to be educational as well as entertaining and enlightening. Igor Stravinsky’s Variations on Bach’s “Vom Himmel Hoch” checked that box. Stravinsky, as Wachner explained, set out to put a 20th century stamp on 18th century music for the unusual setting of chorus plus orchestra without any violins. Just two flutes, three oboes and three bassoons for winds; three trumpets and three trombones for brass; and three violas and harp for strings. What it is, is a chorale of “From Heaven Above to Earth I Come” followed by five variations, focusing separately on brass, on woodwinds, on choir and orchestra, on flutes and choir, and finally on harp and choir. It was a fine performance by the chorus and orchestra. If nothing else, it demonstrated Wachner’s willingness to explore new territory and lead Bach fans on surprising new adventures. The program opened with Bach’s Cantata No. 110, “Unser Mund sei voll Lachens” or “Our Mouth is Full of Laughter,” a cantata with four solo voices. With each aria, Wachner adjusted the continuo instruments in a new and more interesting configuration. The performance featured the sweet tenor voice of Brian Giebler, accompanied by Christopher Kantner and Ruth Bylsma in a beautiful flute duet, on the aria, “You thoughts and you senses, spring up from here.” Giebler was joined by Quinn for the duet, “Glory to God in the Highest,” two nicely matched voices with pizzicato continuo. The bass aria, “Wake up, you veins and limbs, and sing joyful songs,” delivered powerfully by Dashon Burton alongside brilliant piccolo trumpet playing by Neil Mueller, was straight from Handel’s playbook for pomp and propulsion in equal measure. With the final chorale, “Alleluia! God be Praised,” the chorus delivered a volume of sound that its composer could only imagine in his wildest dreams. But the Grand Rapids Bach Festival audience got enjoy each and every enchanting note. Singers participating in the 2019 Grand Rapids Bach Festival’s inaugural Linn Maxwell Keller Distinguished Bach Musician Award were promised a $10,000 cash prize meant to encourage and promote their careers as professional singers. Contestants also were told they may be offered a future appearance with the biennial festival created by Linn Maxwell Keller in 1997. 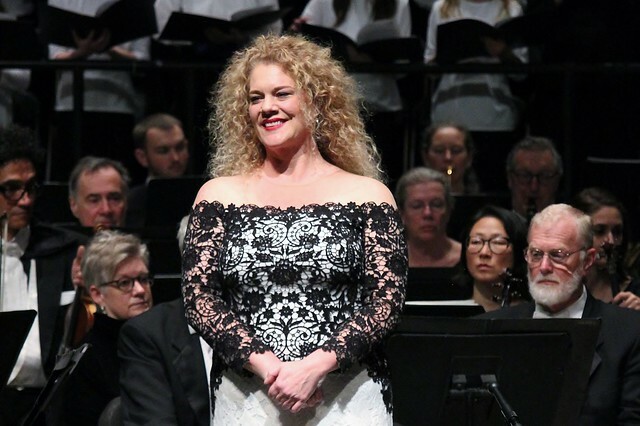 For soprano Nola Richardson, winner of the first Keller Award, that future appearance came less than two-and-a-half hours later with The Choir of Trinity Wall Street and the Grand Rapids Symphony on Thursday, March 21. Richardson, 32, of New York City, was awarded the $10,000 prize that afternoon following the second and final round of competition in Grand Rapids as part of the 12th biennial Grand Rapids Bach Festival, led by Artistic Director Julian Wachner. Meanwhile, earlier in the day, a singer previously engaged to perform Thursday evening with the Grand Rapids Symphony had to cancel her appearance in Johann Sebastian Bach’s Mass in A Major as part of the Grand Rapids Bach Festival. On Thursday afternoon, Richardson, had sung the soprano aria, “Qui tollis peccata mundi,” from the Bach Mass in A Major as one of her three competition selections. Though Wachner was not one of the judges for the Keller Award, he had served as master of ceremonies at the competition’s semifinal round on Tuesday and at its final round on Thursday, both held in the Cathedral of Saint Andrew in Grand Rapids. “Upon her winning the award at 4:30 p.m., I said to Nola, ‘You have a gig tonight,’” said Wachner, who also is Director of Music and Arts at New York City’s famous Trinity Church Wall Street. 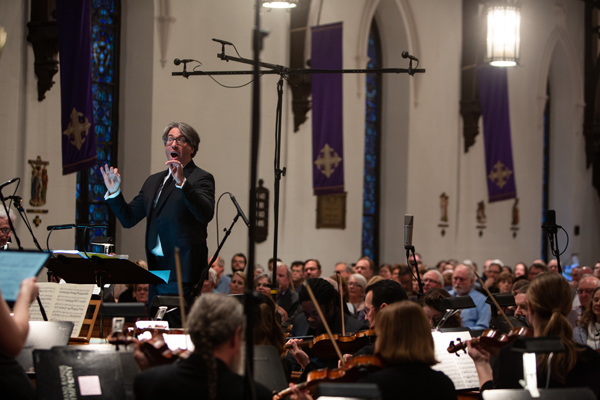 At 7 p.m. Thursday, Richardson joined three other soloists, The Choir of Trinity Wall Street from New York City, and the Grand Rapids Symphony in a concert before a full house in St. Mark’s Episcopal Church in downtown Grand Rapids. Praised by the New York Times for her “beautiful tone” and the Washington Post for her “astonishing balance and accuracy,” “crystalline diction” and “natural sounding ease,” soprano Nola Richardson has performed Bach’s Cantata No. 51 and Scarlatti's Su le Sponde del Tebro with the Baltimore Symphony Orchestra; “Simply Sondheim” with the Boston Pops; and Handel's Messiah with the Colorado Symphony. Richardson participated in the premiere of Michael Gandolfi’s Carroll in Numberland alongside soprano Dawn Upshaw at Tanglewood, and she made her Kennedy Center debut in Handel’s Radamisto with Opera Lafayette. With Yale Schola Cantorum, she’s performed Arvo Part’s Passio on tour to Russia, Estonia and Latvia. The native of Australia was a top prizewinner in the Audrey Rooney Bach, the Bethlehem Bach, and the Handel Aria Competitions, and she as appeared with the American Bach Soloists, Seraphic Fire, Clarion, the Baltimore Choral Arts Society, the American Classical Orchestra, the Colorado Bach Ensemble, and the Blue Hill Bach Festival. 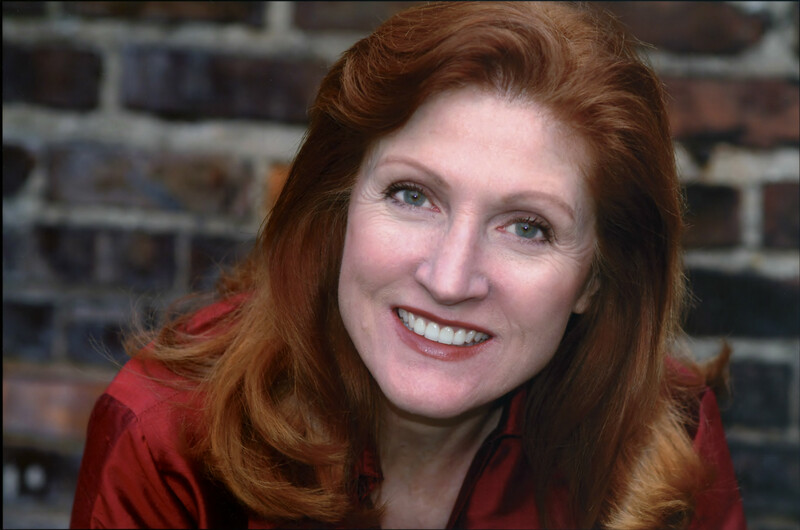 Mezzo soprano Linn Maxwell Keller, who graced international concert halls and opera houses in her career, sang at major Bach festival throughout the United States including the Oregon Bach Festival under Helmuth Rilling. In 1997, she founded the biennial Grand Rapids Bach Festival as a week-long, community celebration of the music of J.S. Bach. In memory of Keller, who died in 2016, the Grand Rapids Bach Festival established the $10,000 Keller Distinguished Bach Musician Award. The inaugural competition, to encourage and support gifted, young singers in pursuit of professional careers in music, made its debut at the 2019 Grand Rapids Bach Festival, running March 17 through March 24 in Grand Rapids. Six singers, all between age 18 and 34, performed in two rounds of competition in the Cathedral of Saint Andrew. The jury of countertenor Daniel Taylor, baritone Stephen Salters, and Lori Lee Curly, president of the Grand Rapids Bach Festival’s Board of Directors, unanimously chose Richardson as the winner of the inaugural Keller Award. Linn Maxwell Keller loved to sing, and she did it well. During a long and successful career, she graced stages from Grand Rapids to the grand opera houses of major European cities. The founder of the Grand Rapids Bach Festival also sang in major Bach Festivals throughout the United States, including the Oregon Bach Festival under Helmuth Rilling. In memory of Keller, who died in 2016, the Grand Rapids Bach Festival established the $10,000 Keller Distinguished Bach Musician Award. The inaugural competition, to encourage and support gifted, young singers in pursuit of professional careers in music, brings six singers to Grand Rapids this week for the 12th biennial Grand Rapids Bach Festival. “This is a major, monetary gift or award, particularly for a singer,” said Julian Wachner, Artistic Director of the Grand Rapids Bach Festival. Six singers, all between age 18 and 34, will perform in two rounds of competition in the Cathedral of St. Andrew. A semi-final round at 2 p.m. Tuesday March 19, will select finalists who will advance to the final round at 3 p.m. Thursday, March 21. Both performances are open to the public with free admission. The $10,000 Keller Award will be announced at the end of the final round. The four women and two men coming to Grand Rapids include one singer who originally is from Australia and another originally from Japan. Soprano Nola Richardson, who has performed with American Bach Soloists and Seraphic Fire and was a top prizewinner in the Bethlehem Bach and Handel Aria competitions. Soprano Motomi Tanaka, who has appeared with the Princeton Festival Baroque Orchestra and Chorus and was a featured Young Artist with ARTEK’s Madrigal Madness in New York City. 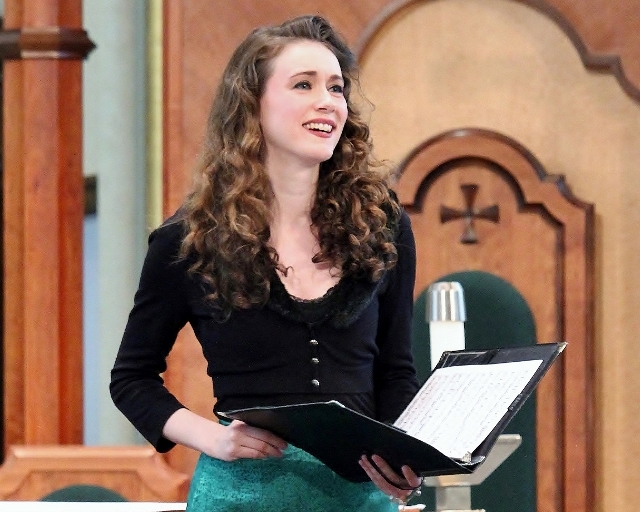 Mezzo-soprano Rebecca Myers, who has been a studio artist with the Boulder Bach Festival Chamber Ensemble and debuted with Eklund Opera in the title role in Handel’s Ariodante. Mezzo-soprano Clara Osowski, a prize winner at the Thomas Quasthoff’s International Das Lied Competition in Heidelberg, Germany, and a finalist in the Wigmore Hall/Kohn Foundation Song Competition in London. Tenor Scott Brunscheen, who performs regularly with Haymarket Opera as well as with Chicago Opera Theater, Long Beach Opera and the Caramoor Bel Canto Festival. Baritone Clayton Kennedy, who is a frequent soloist in Arte Musica Foundation’s series The Complete Cantatas of J.S. Bach, and who has been a soloist with Ensemble Caprice and the Montreal Symphony Orchestra. “We’ve had so much interest, and we have a fantastic slate of semi-finalists from all over North America,” Wachner said. Linn Maxwell Keller’s original vision for the Grand Rapids Bach Festival included not only performances but also educational opportunities, which led to the creation of the $10,000 prize. The mezzo-soprano originally from Indiana eventually would sing in Bach festivals in Carmel and in Rochester among other places.. But her career received a major boost when she won the “Joy in Singing” Competition in 1976, which included a debut performance in Alice Tully Hall in New York City’s Lincoln Center for the Performing Arts. Over 150 memorial gifts and donations from friends, family and fellow musicians were contributed to establish the prize, which will be awarded at future Grand Rapids Bach Festival’s in Keller’s memory. During his lifetime, Johann Sebastian Bach wasn’t well-known as a composer. But in the region of Germany in which his last name was synonymous with musician, Bach was widely regarded as the greatest organist of his day. In West Michigan, the 2019 Grand Rapids Bach Festival opened with a magnificent solo organ recital by its new Artistic Director Julian Wachner. Some 450 people filled the Basilica of St. Adalbert for an amazing evening of music by Bach plus virtuoso organ works by Maurice Duruflé and Charles-Marie Widor. The 12th biennial Grand Rapids Bach Festival promises eight days of wonderful music, including solo cantatas, choral music and solo organ recitals you’d naturally expect. But the festival that opened March 17 also includes MarimBach featuring Grand Rapids Symphony percussionists playing the music of Bach on marimbas. Activities also include BachBends, a program of yoga to the music of Bach, and KinderBach, a play-based program for young children and adults. If that isn’t enough, six young singers on Tuesday and Thursday will compete for the $10,000 Linn Maxwell Keller Distinguished Bach Musician Award. The program especially was a treat for the audience. 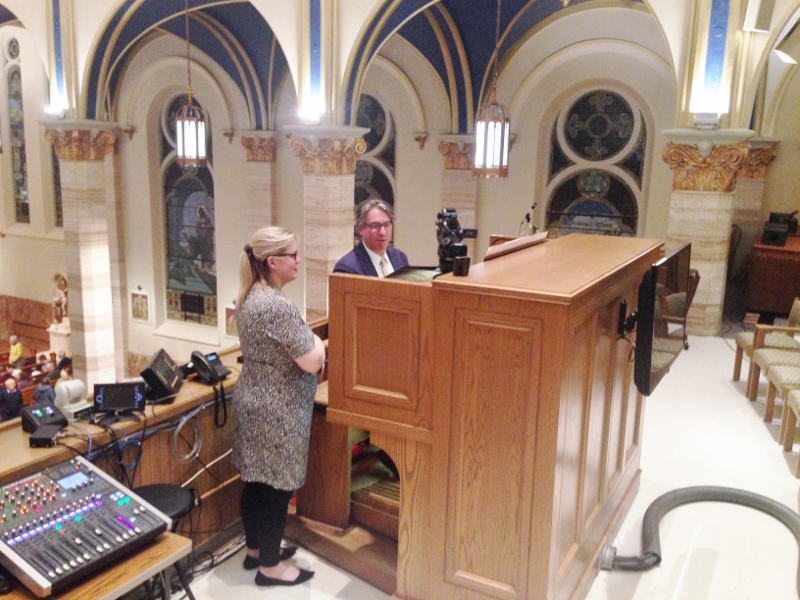 Though the organist ion the Basilica of St. Adalbert is situated in the loft to the rear of the congregation, closed-circuit TV, using three cameras and three strategically placed screens, gave the listeners a close look at Wachner’s fingers and feet throughout the performance. Much as Bach was Cantor of St. Thomas Church in Leipzig for the final 27 years of his life, supervising music at four churches in the mercantile city in the Electorate of Saxony, Wachner is director of music and arts at New York City’s famed Trinity Wall Street Church in the financial district of lower Manhattan. Like Bach, Wachner also is a composer, and the Bach Festival will hear some of Wachner’s music on Thursday for a program titled Mass Reimaginings at St. Mark’s Episcopal Church, which will feature the 28-voice Choir of Trinity Wall Street. And like Bach, Wachner is an accomplished virtuoso who performed an elegantly tasteful version of Durufle’s Prelude et Fugue sur le nom d’Alain, and a show stopping performance of Widor’s Toccata from Symphonie No. 5, which made good use of the resources of St. Adalbert’s Wicks pipe organ. Naturally, music by Bach filled a large portion of the program. No less impressive was his performance of Bach’s Fantasia in G major, Piece d’Orgue, a three-part work, which Wachner imaginatively said implies three stages of life from childhood to adulthood to old age. The first part was a delightful section for manuals only, suggesting children at play. The dense, polyphonic middle section called to mind the challenges and complexities of maturity. The finale, growing softer with a slow, descending progression in the pedals called to mind the quiet of final years and the peaceful conclusion to a long life. Taken together it made for an interesting musical journey led by a master performer. The program opened with a familiar melody, Wachner’s Fanfare Variations on Jean-Joseph Mouret’s Rondeau, which is well-known to viewers of PBS-TV’s Masterpiece. Bach in his day was renowned as an improviser at the keyboard. It’s a tradition that Wachner not only continues to practice, he excels at as well. It opened with Irish hymn tune Slane, commonly known as Be Thou My Vision, in an imaginative interpretation of the traditional melody, often fragmented into bits that poked through the accompaniment. That segued into a sly, subversive improvisation on Twinkle, Twinkle, Little Star, which took the audience a while to catch on to until he made it crystal clear with an obvious statement of the melody using the organ’s chimes. The finale, which blended the two incongruous melodies, was the most imaginative of all with a little of the former and a little of the latter. The audience loved it. Prior to the performance, Wachner asked the audience to sing a verse of “Be Thou My Vision” and kicked it off. He was delighted to discover they not only could sing it, they were willing to do it. “I’m not sure that would happen in New York City,” he said with a laugh. The music of Johann Sebastian Bach is transformative. It has motivated the work of nearly every great composer to follow in the history of Western Classical music. It continues to inspire those who hear it more than 269 years after Bach’s death. The 12th biennial Grand Rapids Bach Festival, the first under its new Artistic Director Julian Wachner, returns this week with eight days with a week of concerts and activities celebrating the life and work of the composer whose music represents the pinnacle of the Baroque Era. An affiliate of the Grand Rapids Symphony, the Grand Rapids Bach Festival will present the inaugural Linn Maxwell Keller Distinguished Bach Musician Award, a $10,000 cash prize in memory of Keller, an accomplished singer who founded the festival in 1997. 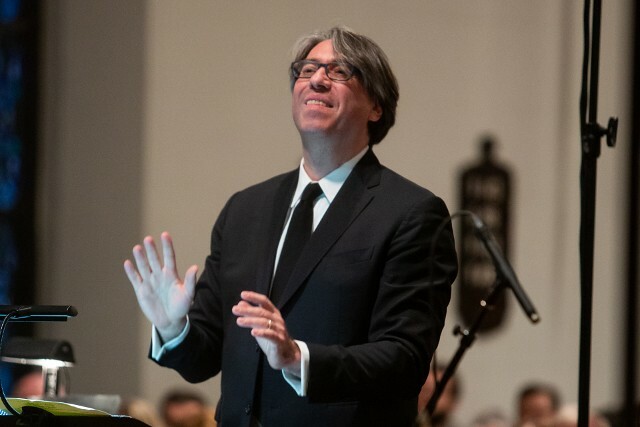 Julian Wachner, a keyboardist, conductor, composer and a Grammy nominated recording artist, serves as Director of Music and the Arts at New York City’s historic Trinity Church Wall Street, and Wachner will bring his 28-voice choir to Grand Rapids during the eight-day festival opening March 17. The Bach Festival Artistic Director chair is sponsored by John & Mary Loeks | Studio C.
New York City’s Trinity Church Wall Street is famous. The church founded in 1697 was the setting for the climax of the 2004 film National Treasure. Its St. Paul’s Chapel, located across the street from the World Trade Center in lower Manhattan, has become a pilgrimage site since 9/11. Under Julian Wachner, Trinity Church Wall Street also has a rich musical tradition, performing the music of Johann Sebastian Bach not just a couple times a year but each and every week. “We’ve done all of the choral and orchestral music of Bach, all 200 cantatas, and all the huge masterworks as well,” said Wachner, Director of Music and Arts and Trinity Church. The 12th biennial festival, the first under Wachner as Artistic Director, is underway this week with concerts and activities celebrating the life and work of the composer whose music represents the pinnacle of the Baroque Era. Guest artists include countertenor Daniel Taylor, a Sony Classical artist, who appears on more than 100 recordings; and organist Isabelle Demers, back by popular demand following her appearance at the 2017 Grand Rapids Bach Festival. Julian Wachner, a keyboardist, conductor, composer and a Grammy nominated recording artist, also gives a solo Organ Recital at 7:30 p.m. Monday, March 18, in the Basilica of St. Adalbert with music of Bach plus virtuoso organ music by Maurice Duruflé and Charles-Marie Widor. Mass Reimaginings at 7 p.m. Thursday, March 21, in St. Mark’s Episcopal Church features a performance of Bach’s Mass in A Major, which is notable for featuring two flutes along with countertenor Daniel Taylor, bass-baritone Dashon Burton, and choir and orchestra. It’s one of four Lutheran masses Bach composed later in life by drawing upon music he had written previously and replacing the texts. Wachner also will lead the orchestra in his own Epistle Mass, composed for Trinity Church Wall Street. In addition to the mass sung by choir, baritone Stephen Salter sings a new text by Pulitzer Prize-winning librettist Royce Vavrek. The Grammy-nominated Choir of Trinity Wall Street travels to Grand Rapids for the performance. 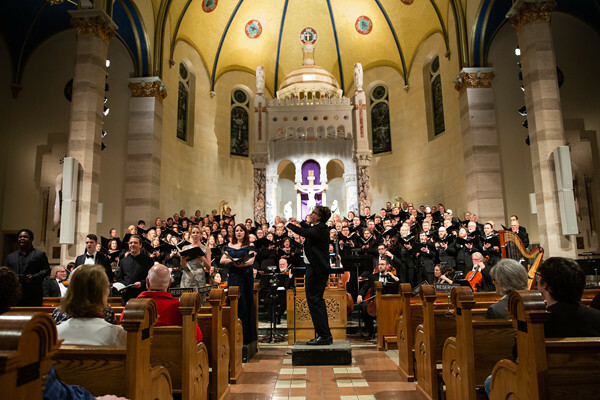 Bach Magnificat, the festival finale concert at 8 p.m. on Saturday, March 23, in the Basilica of St. Adalbert includes Bach’s setting of the Magnificat in D Major with guest soloists including soprano Molly Netter, tenor Brian Giebler, joined by Taylor and Burton. Also on the program is Bach’s Cantata No. 110, “May Our Mouth Be Full of Laughter.” It’s another piece of that Bach adapted from an earlier work. Grand Rapids Symphony’s audience that attended last October’s Baroque Concert: Bach and Beyond will recognize the opening of Bach’s Orchestral Suite No. 3, which GRS Music Director Marcelo Lehninger conducted in St. Cecilia Music Center. Four acclaimed vocal soloists join the Grand Rapids Symphony and Grand Rapids Symphony Chorus for the program. Among other concerts, the Grand Rapids Symphony percussion section presents MarimBACH, an evening of 18th century music on marimbas and other mallet instruments, at 7:30 p.m., Tuesday, March 19, in Fountain Street Church. The 2019 Grand Rapids Bach Festival welcomes back French-Canadian organist Isabelle Demers for a solo recital at 12 noon on Wednesday, March 20, in Grace Episcopal Church in East Grand Rapids. 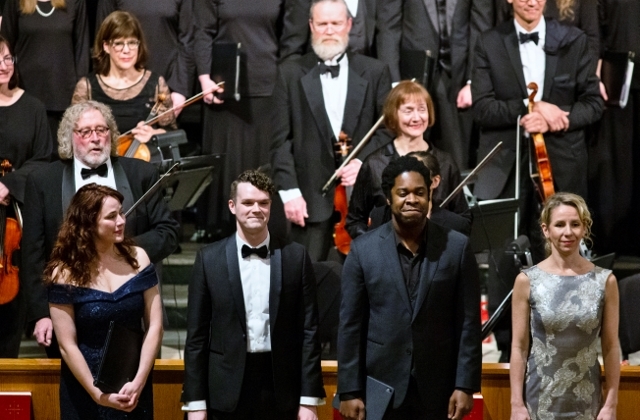 Three guest vocal soloists, soprano Molly Netter, countertenor Daniel Taylor, and bass-baritone Dashon Burton, will perform three cantatas by Bach for a program titled Noontime Bach at 12 noon on Friday, March 22, in First United Methodist Church in Grand Rapids. Besides musical performances, “Bach in the City” will include such activities as BACHBends yoga and KinderBACH for young children and adults. Locally, the Donut Conspiracy and Love’s Ice Cream have created special, limited-time taste treats especially for the 12th biennial festival. A special $40 Bach Pass, in addition to priority seating at all concerts and entry to two exclusive post-concert receptions, includes discounts at local restaurants including MeXo Restaurant, Littlebird Restaurant, and Linear Restaurant as well as at Apothecary Off Main on Monroe Center. Organized in 1997 as a three-day celebration of the music of Bach, the first Grand Rapids Bach Festival engaged German organist, scholar and conductor Karl Hochreither, a noted authority on Bach’s church music, to serve as music director for several of the early festivals. Linn Maxwell Keller died in 2016, but the Grand Rapids Bach Festival she founded lives on. Like so many other kids, George Li began piano lessons at age 4. Though it soon was clear he had a special gift, for years, it was just a hobby. One day at age 11, while performing Beethoven’s First Piano Concerto, the Boston native had an epiphany. 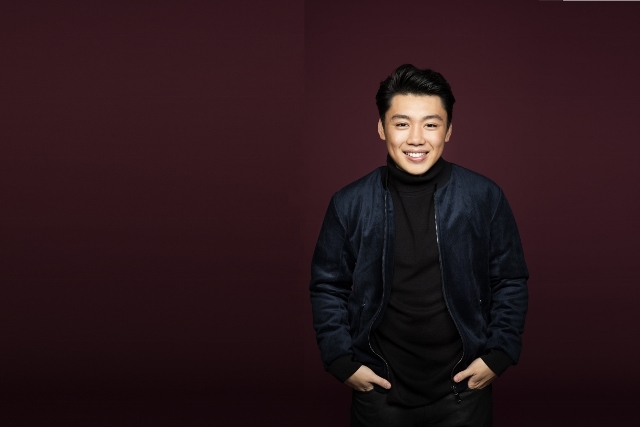 Li, the Silver Medalist in the 2015 International Tchaikovsky Competition, returns to the Grand Rapids Symphony stage for a concert titled Rachmaninoff and Shostakovich on Friday and Saturday, March 15-16 at 8 p.m. in DeVos Performance hall. Li will be soloist in Rachmaninoff’s Piano Concerto No. 2, one of the most popular works for piano and orchestra in the entire repertoire. “I’ve never worked with him, but I’ve heard such incredible things about him,” Music Director Marcelo Lehninger said recently. 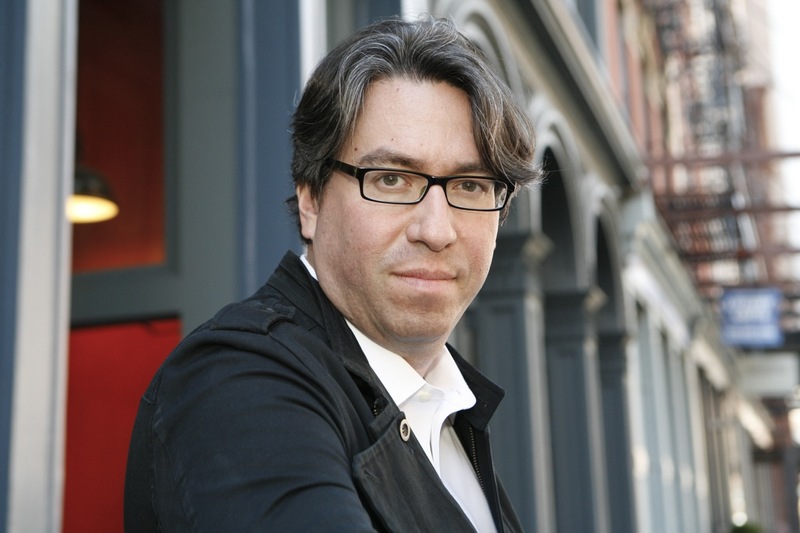 Lehninger also will lead the Grand Rapids Symphony in Dmitri Shostakovich’s Symphony No. 5. The concerts open with Moxie, a short, satirical work by American composer Kristin Kuster. Seven years ago, the American-born son of Chinese immigrants was named a Gilmore Young Artist of the Irving S. Gilmore International Keyboard Festival. Just 15 years old, the youngest-ever Gilmore Young Artist made his debut at age 16 with the Grand Rapids Symphony, performing Schumann’s Piano Concerto in A for the symphony’s Rising Stars Series. Three years later, Li took the Silver Medal at the 2015 International Tchaikovsky Competition. The following year, the pianist from Boston won an Avery Fisher Career Grant. In 2017, Warner Classics released his debut recording. Now 23 years old, Li just graduated from college – from Harvard University with a bachelor’s degree in English and a master’s degree in music from New England Conservatory through a joint degree program. Dr. MaLinda P. Sapp, a pastor and counselor, a psychologist and college professor, a wife and mother, was an inspiration to all of those whose lives she touched in a life that was all too-short. 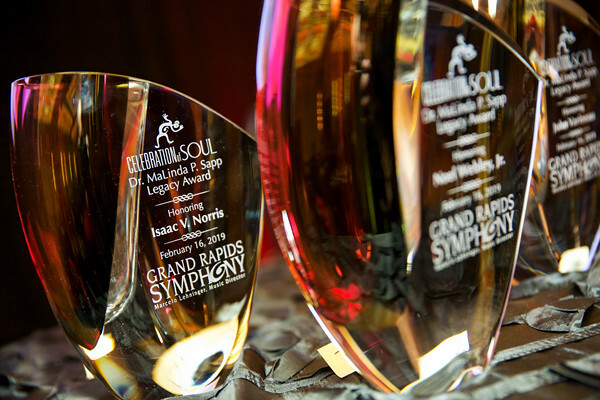 In 2006, the Grand Rapids Symphony launched its annual Celebration of Soul Gala to honor members of the community who have worked tirelessly to promote diversity, equity and inclusion in West Michigan. The 14th annual Celebration of Soul Gala, held Saturday, Feb. 16, honored three more individuals with the Dr. MaLinda P. Sapp Legacy Award. Architect and jazz musician Isaac V. Norris, conductor and educator John Varineau, and teacher, photographer and jazz musician Noel Webley Jr. were honored in the gala held at the JW Marriott’s International Ballroom. The concert preceded the 18th annual Symphony with Soul concert, with special guests, Black Violin, held in DeVos Performance Hall. The threads that weave the three honorees together into the fabric of the Grand Rapids Symphony family are access and inclusion, said Grand Rapids Symphony President Mary Tuuk. Isaac V. Norris, for more than 25 years, has successfully owned and operated his own architectural firm, Isaac V. Norris and Associates, located in the urban core of Grand Rapids. In his career, he has designed many facilities in the city such as The Salvation Army’s Ray and Joan Kroc Community Center, The Rapid-BRT Transit Stations, the Gerald R. Ford Academic Center, and many local LEED-certified affordable housing developments. A lifelong resident of Grand Rapids, Norris, while still attending Creston High School, interned for Judson Jones, who was the only African-American architect working in Grand Rapids. Following his mentor’s example, Norris has taken many other young architects under his wing. “It’s hard to be what you cannot see,” Norris said more than once while accepting his award. John Varineau, associate conductor of the Grand Rapids Symphony and director of the Grand Rapids Youth Symphony, has been a part of the orchestra for 34 years. He also has taught in most area colleges and continues to teach at Calvin College where he conducts the Calvin College Orchestra as well as the Calvin Community Symphony. With former music director David Lockington, the late Cedric Ward, and others, Varineau was a co-founder of the Grand Rapids Symphony’s annual Symphony with Soul concert, an effort to begin bringing music to everyone in the community. Noel Webley Jr, a native of Grand Rapids, taught art in the Grand Rapids Public Schools for 33 years before retiring. In 1972, he began playing jazz bass in his father’s nightclub, and he continues to be an active musician in the area. In 1984, his hobby of photography became another professional pursuit when he joined the staff of The Grand Rapids Press as a regular freelance photographer, shooting many Grand Rapids Symphony concerts and events over the years. One of the many students he taught at Ottawa Hills High School over the years was MaLinda Sapp. “Even at that age, she was one of the kindest and classiest young ladies,” Webley recalled. The three join a long list of artists, musicians, educators, journalists, ministers, philanthropists, and social justice crusaders who have received the Dr. MaLinda P. Sapp Legacy Award, among them Herschell Turner, Edye Evans Hyde, Bishop William Abney and Patricia Pulliam. Such institutions as the Grand Rapids Urban League, Hispanic Center of Western Michigan, Baxter Community Center, Cherry Health, and W.K. Kellogg Foundation, and companies including Celebration! Cinema and Huntington Bank also have received the award. In 2010, shortly before her death, MaLinda Sapp and her husband, Bishop Marvin L. Sapp, co-founders of Lighthouse Full Life Center Churches in Grand Rapids and Muskegon, were honored with the Grand Rapids Symphony’s Legacy Award. In her memory, the Grand Rapids Symphony named its Legacy Award after her.